In this article US Chemical Storage demonstrates safe storage practices and the risks associated with storing flammables and combustibles. Flammable and combustible chemicals can be very dangerous, and in extreme cases they can be deadly. It is necessary to understand the risks associated with each chemical being stored or handled, the hazard classifications of the chemical and safety practices in the event of a hazardous situation. Chemicals should be stored no higher than eye level on shelves, inside your flammable chemical storage locker. Segregate all incompatible materials into different storage areas with a solid or fire-rated partition wall. Label and date chemicals to properly track inventory. Keep chemical storage away from ignitable sources including direct sunlight or heat. Utilize ventilation systems in your flammable chemical storage locker to eliminate harmful vapors or gases. Do not dispose of flammable or combustible chemicals down drains or other household disposal systems. Store poisons separately from other hazardous chemicals. Make sure all chemical containers are sealed tightly. Do not store oxides next to flammables, or acids next to bases. Be sure to store dangerous chemicals in climate controlled rooms. Check with US Chemical Storage’s chemical storage guide for specific storage instructions. Use Material Safety Data Sheets (MSDS) as a guide to making storage decisions. US Chemical Storage is dedicated to keeping you safe, while keeping your personnel and investments protected. Our flammable chemical storage lockers’ customizable design allows you to meet any specific requirements needed. 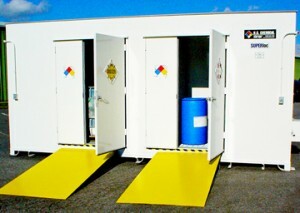 Flammable chemical storage lockers by US Chemical Storage offer maximum safety and full compliance. Constructed by professional engineers and hand-welded by experienced certified welders for a strong and reliable end-product. All flammable chemical storage lockers are built for maximum strength and full compliance. Meets EPA, OSHA, NFPA, IBC, IFC regulations and FM or Warnock Hersey approvals. The flammable chemical storage locker by US Chemical Storage can be customized with 2-hour fire-rated or a 4-hour fire-rated protection; depending on variance allowances. Designed in accordance with NFPA Code 30 requirements. The 100% customizable flammable storage locker is perfect for storing flammable liquids or corrosives. Increased protection from chemical exposure. Ensure personnel and investment safety.